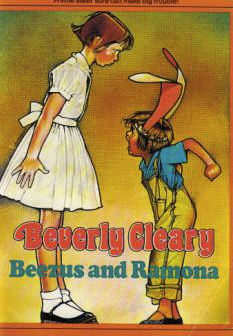 While I have been taking a day or two from the internet for some mourning time we took Kid to see Ramona and Beezus, which if you are not familiar with it, is a movie based on the Ramona Quimby children’s book series by Beverly Cleary. Ramona and Beezus is loosely adapted, covering all of the books from Beezus and Ramona to Ramona’s World. As a child about Kid’s age I was an avid reader, and the Ramona Quimby books were some of my favorites that I think I read again and again. I am sure that by the time I was Kid’s age I had read them at least twice. I had forgotten about them until I saw the poster for this movie, and have been collecting the books up for Kid since. They are a little under her reading level, but right around her amusement level, for sure. Just as I did, we have found that she relates to Ramona as a person who is imaginative and sometimes misunderstood. Ramona, by the end of the series, and for the purposes of the movie and this review, is a nine-year old girl. She has an active imagination that sometimes gets the best of her, and a ton of energy that she sometimes has trouble channeling in the proper ways, because it is very creative energy and she has trouble expressing that to adults who have forgotten how to think as creatively as children easily do. While this is a series about primarily a young girl and how she relates to the people in her world, the problems Ramona faces are fairly universal (from a fairly privileged standpoint), dealing with everything from sibling rivalry, school anxiety, feeling left out, bullies, the emotional distress of a parent losing a job, of your parents fighting, and many other things that young children deal with as they mature. Part of what I loved and clung to about Ramona as a child was that her family was not the perfect family that I saw on TV or in movies as a child. Ramona and her sister fought. Ramona’s parents didn’t always get along. Ramona’s family had trouble with money, and Ramona often had to wear hand-me-downs too. Ramona sometimes did silly things and was laughed at. It made me realize that I was not that far off from other kids, that somewhere my story could not have been that unusual, because some lady somewhere knew enough about it to stick it in between a book cover (well, some generalities, but it was a start…). The movie, Ramona and Beezus, was a charming adaptation. The lead, Joey King, broke my heart with her perfect portrayal of Ramona Quimby. The way this was adapted hit so many parts that took me back instantly to the books that I used to sneak under my bed sheets at night on my top bunk with my flashlight and try to quietly read after bedtime. Small details that I thought they missed (Ramona’s toothpaste) came up later and made me laugh while I was busy sniffling (in all fairness, the day you are crying in bouts because you miss your dad is not the best day to see such a sentimental movie, but I digress…). There were some things that were noticeably left out, such as Ramona’s war with her father over his smoking and some other things that you expect to get lost in a movie translation. But, overall, it made the shift to the big screen while staying true to the spirit of the books. It passed the Bechdel test with flying colors, with scenes between Ramona and Beezus, Ramona and her Mother, Ramona and Aunt Beatrice… all very well done. The movie had way more source material involving Ramona and her Father, and it was obvious. I often see movies about fathers and daughters and their relationships. Only here and there did it touch into Ramona’s relationship with her mother (the extra-heavy suitcase). I remember Ramona’s mother being the more strict of the two parents, but really, I felt an obvious lack of presence from Ramona’s mother. The scene with Picky-Picky was well done, but could have used more of an emotional portion of having to have Mrs. Quimby discover what her daughters did to spare her having to deal with this on top of working and all the other stress she was experiencing. Selena Gomez played a fabulous Beezus. I have really enjoyed her as a young star so far (I admit to liking her on her Disney channel show, Wizards of Waverly Place, it being one of the few shows I can stand on the Channel). She is an up and comer if I do say so myself, and by the career she has had already, I think she would agree! Selena Gomez is of Mexican American and Italian descent and, from what I can tell by peeking around in the bios of the rest of the cast, no one else cast as her family in this movie has similar ethnicity. Part of me finds it troubling that Gomez would be cast in a role where part of her identity could be so erased. Part of me is struggling to come to terms with the possibility that they were trying to present a mixed-ethnicity family… except that is not what one could gather from this situation with two predominantly white parents. I am not arguing that Gomez should not have been cast because she was “too Hispanic” or anything like that, but that since she and King were the leads for this movie, perhaps more attention should have been paid tot he family they constructed around them. I can’t help but feel as if it was a careless disregard and erasure of part of Selena Gomez’ identity. All of that aside, I found Ramona and Beezus charming and a throwback to my childhood. I also found in it an ache to re-read some classic books that gave me a great feeling of closeness with a character that helped me remember that it was OK to be different. That sometimes being different and creative and a bit of an oddball was OK, and even lovable. I recommend the movie, directed by a women, and based on source material written by a woman, and containing a lot of moments between and about girls and women, it was a very funny and fun (yes they are different) movie.